We went to Batu Ferringhi today, which is further down the coast of Pulau Pinang (the island of Penang) from where we were staying. 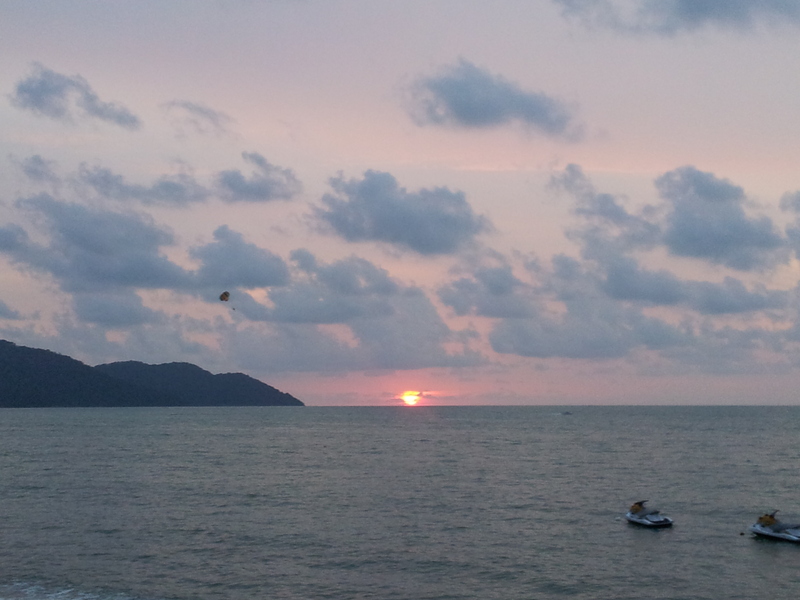 We had dinner and then watched the sun set at a beach. That sunset was a really unique moment in time because we were listening to my cousin’s radio show in Canada using the Tune In Radio app on my Dad’s phone. At the same time we could hear the call to prayer from a nearby mosque. The scene in front of us was a beach sunset, with two people para-sailing, and women in full burquas zipping around on seadoos. And we knew that as we watched that scene, Boston was in full lock-down on the hunt for the 2nd bomber. It really was a scene I will never again experience. After the sunset we walked along Batu Ferringhi’s famous night market. It is set up along a sidewalk down a major road in the town. Stalls at the market sell mostly purses, watches, jewellery, hairbands and clothing. 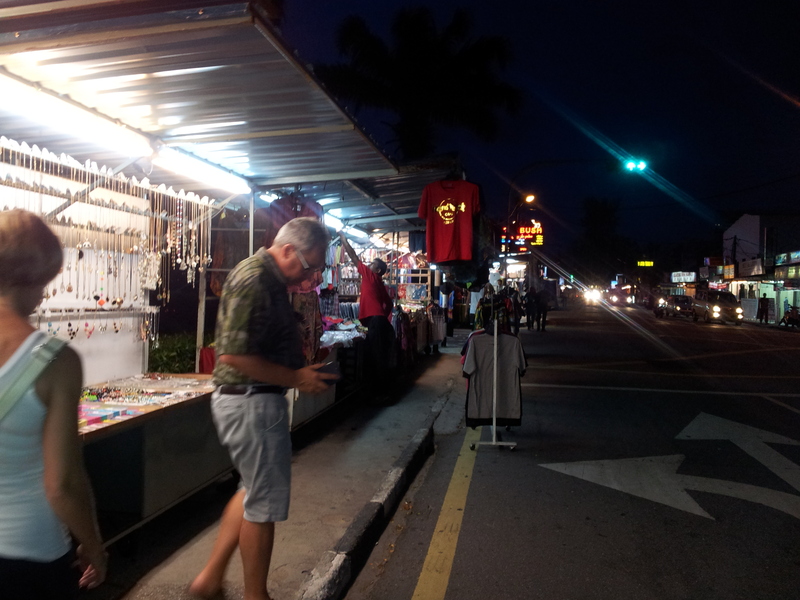 It was neat, cheaper and different items than the night markets in Hong Kong. Thankfully, even though it was set up along a sidewalk, there were no open sewers like other places in Penang. That would have been quite the hazard. 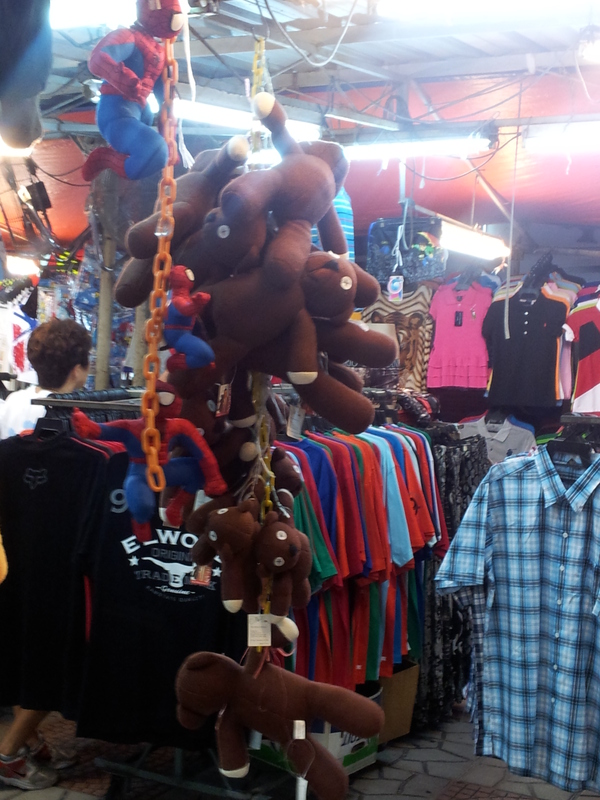 One of the funny things that I noticed in Penang was that Mr. Bean teddy bears are EVERYWHERE! They sell them in all kinds of shops and market stall around town, which makes me wonder if Malaysians are big Mr. Bean fans or whether a store accidentally ordered 5000 instead of 50 and then offloaded them to the markets around town. When you arrive on an international flight, right before you land the flight attendants are required to spray aerosolized insecticide through the whole cabin in order to kill any bugs onboard. I get the whole public health aspect of it, but it was really unpleasant. Traffic, so much traffic. With little public transit and a lower density city with sprawl, it can be very slow to get from point A to point B. On the day we left, there was political nominations, which was apparently going to bring several thousand police into the city for the day. Plus there was a Busta Rhymes and Ludacris concert going on so we were lucky that our flight was early in the morning because if it had been later in the day the traffic would have been a nightmare. They still have pedicabs. The guys who drive them all look over 50 and weather-beaten. Very much how I picture the old rickshaw coolies of Hong Kong. It was a fun trip, nice to feel some real heat and sun after the long Canadian winter. 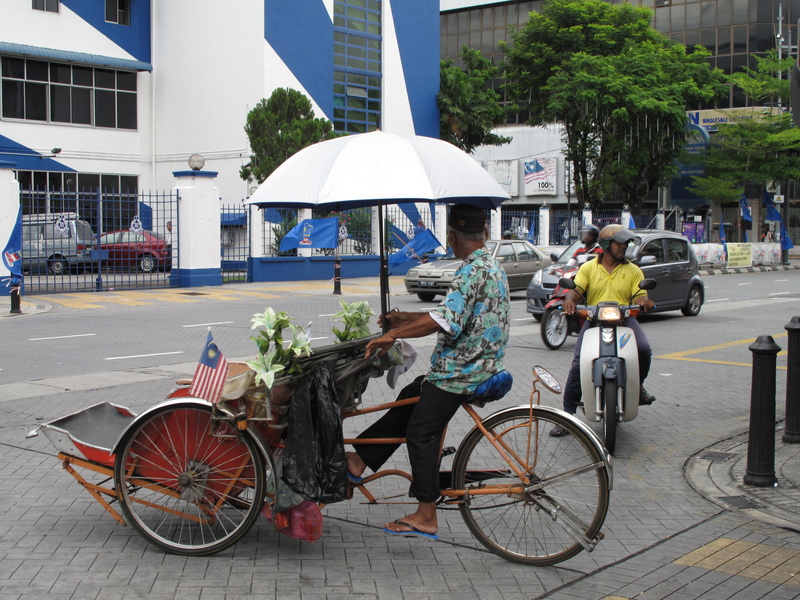 What I like most about going new places is exploring them on foot, however in Penang, this was hard to do because there is little public transportation, it is not very pedestrian friendly, and things are very spaced out. Because of these barriers and my short stay, I know I didn’t see and do all that Penang has to offer. One of the political parties up for nomination is promising a monorail for the city, so maybe next time I go, I’ll zip around on that.